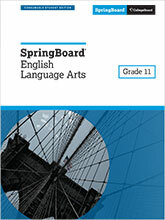 Students develop skills in reading and writing while participating in courses that are structured around different themes. 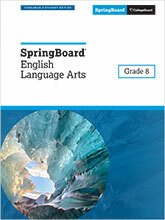 Beginning in grade 6, SpringBoard English Language Arts students develop and refine skills in critical thinking, close reading, writing in various genres, and doing research. Over the course of the program, they read and analyze a wide range of texts in genres including poetry, novels, plays, biographies, nonfiction narratives, speeches, and films. They also learn to write in forms including essays, personal narratives, argumentative texts such as editorials, and research papers. 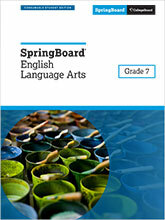 Every ELA course is structured around a theme, such as "Challenges" or "Coming of Age." 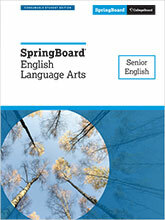 Learn more about teaching SpringBoard ELA. Read works by Langston Hughes, John Steinbeck, and Shakespeare. Write narrative, explanatory, and argumentative texts. Learn specific strategies for planning, drafting, revising, and editing their writing. Explore the fundamentals of research, such as citations and how to evaluate the credibility of sources. Deepen their understanding of topics using film. Read works by Nelson Mandela, Robert Frost, Sojourner Truth, and Shakespeare. 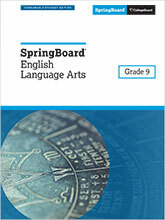 Learn Close Reading strategies to discover the explicit and implicit content of texts. Write in argumentative, explanatory, and narrative modes. Examine how print texts are portrayed in film. Read works by Ray Bradbury and Walt Whitman as well as an essay about Civil War heroes, narratives about the Holocaust, and Elie Wiesel's Nobel Prize acceptance speech. Learn about the hero archetype and the hero's journey narrative in literature. Write narrative, explanatory, argumentative, and other texts. Research an issue in current events and create a multimedia presentation about it. Read scenes from Shakespeare's A Midsummer Night's Dream, watch these scenes in films, and analyze how the adaptation differs from the source. Read works by Harper Lee, Edgar Allan Poe, William Wordsworth, Pablo Neruda, and Shakespeare, as well as informational and historical articles. 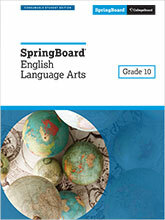 Learn to gather evidence from texts and incorporate it in written and oral responses. Write in argumentative, informational, narrative, and other modes. Read Chinua Achebe's Things Fall Apart, Sophocles' Antigone, Susan B. Anthony's "On Women's Right to Vote," and Aleksandr Solzhenitsyn's Nobel Prize acceptance speech. Study the extent to which culture influences worldview. Incorporate textual evidence in a written argument. Write argumentative, narrative, informational, and other modes. Research a culture and present findings in a collaborative presentation using digital media. Analyze the objectivity and subjectivity of documentary films. Read foundational U.S. documents such as Lincoln's Second Inaugural Address and the Declaration of Independence, essays by Henry David Thoreau and Ralph Waldo Emerson, and Zora Neale Hurston's Their Eyes Were Watching God. Write an informative essay defining what it means to be an American. Write a synthesis essay that argues whether or not America still provides access to the American Dream. Write in a variety of modes and genres. Compare print and film versions of Arthur Miller's The Crucible. Create a news outlet based on real-world news organizations. Read James Baldwin's "Stranger in the Village," George Orwell's "Shooting an Elephant," Shakespeare's Othello, and George Bernard Shaw's Pygmalion. Apply multiple perspectives to complex texts. Learn and apply various types of literary criticism: archetypal, Marxist, feminist, historical, cultural, and reader response. 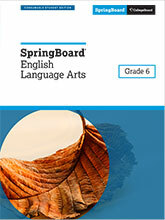 Perform rigorous reading and writing tasks to synthesize learning. Analyze how historical contexts have influenced performances of Othello, and compare multiple film versions of the drama.